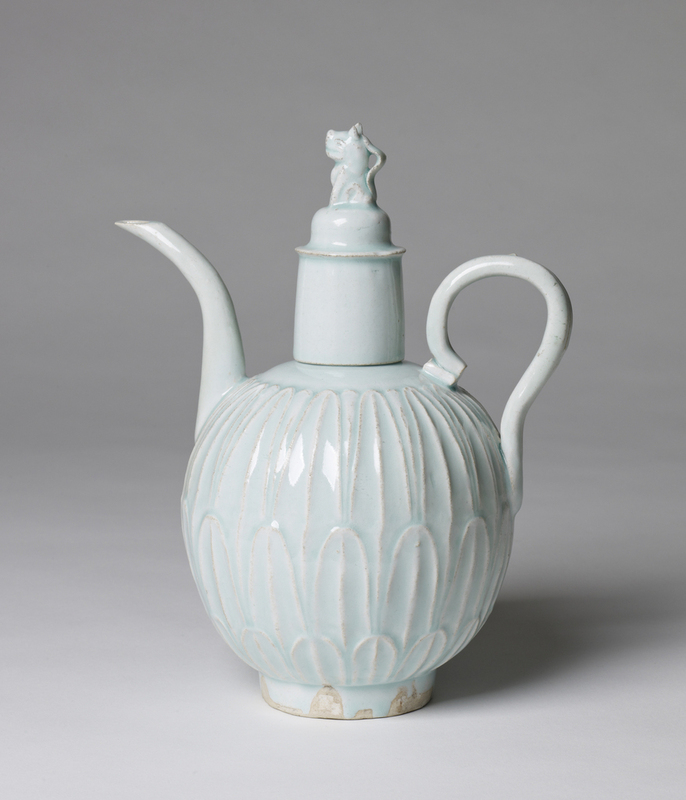 One of the great classical forms of Chinese porcelain is the Lonquan ewer. These green-glazed wine vessels are named for the the Longquan kiln complex in (what is now the) Zhejiang province of South China. The ewers originated in the Song dynasty and the form was characteristic up until the Ming dynasty—but perhaps the heyday of Lonquan ware was during the Yuan dynasty when Mongols ruled China. I suspect most (or all) of these examples are from the Yuan dynasty. Look at the beautiful pear form of the vessels and the sinuous grace of the handles. 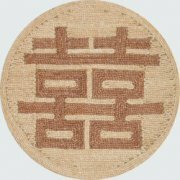 China has a long (and continuing) history of exquisite art, but many aesthetes and Sinophiles feel that the apogee of Chinese craft came during the Song Dynasty (960 AD – 1279 AD). Now I am not sure I agree with the Song purists to that degree, but the work of that era is indeed particularly lovely. Additionally, Song creative forms became the standard templates followed and improved upon in seceding dynasties. Here is a beautiful Song dynasty ewer with a pale blue glaze which illustrates the winsome delicacy of form characteristic of the time. Note how elegantly the slender handle and spout curve into the flower petal body. A little carnivore sits on the stopper: a dog or wolf or cat? This pale blue green color is known as quingbai (“blue-white”). It is a pale translucent blue green over white and it is one of the characteristic trademarks of the era. It is a wonderful little vessel! It’s October—the month of costumes, masks…and monsters. To start out this year’s Halloween season on an appropriately ghastly note, today’s post deals with a horrifying creature which relies upon disguise to feed itself: namely, the Mountain Alcon Blue butterfly (Phengaris rebeli). 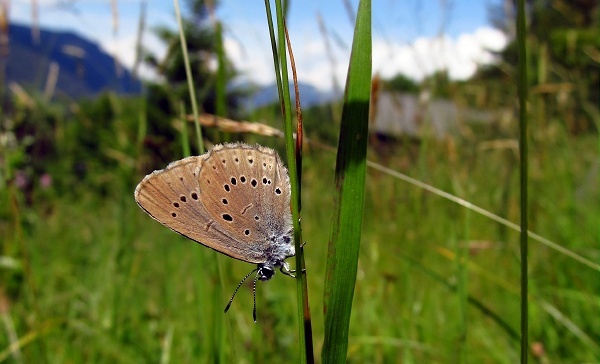 Native to temperate grasslands of Central Europe, the Mountain Alcon Blue has silvery blue which are stippled in little black spots with delicate white edges. 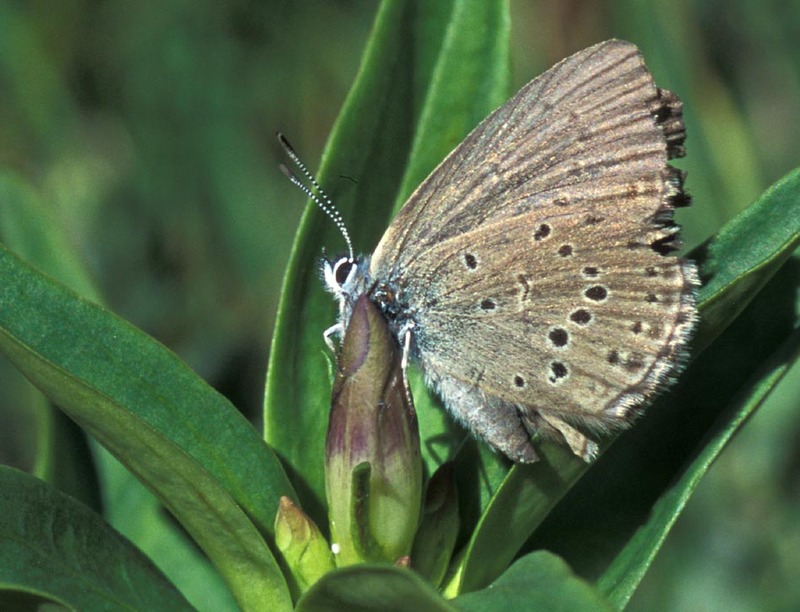 The butterfly flits harmlessly about in gentle meadows, finds a mate, and then the female lays her eggs on a pretty gentian flower. So why is this delicate alpine beauty a creature of nightmares? 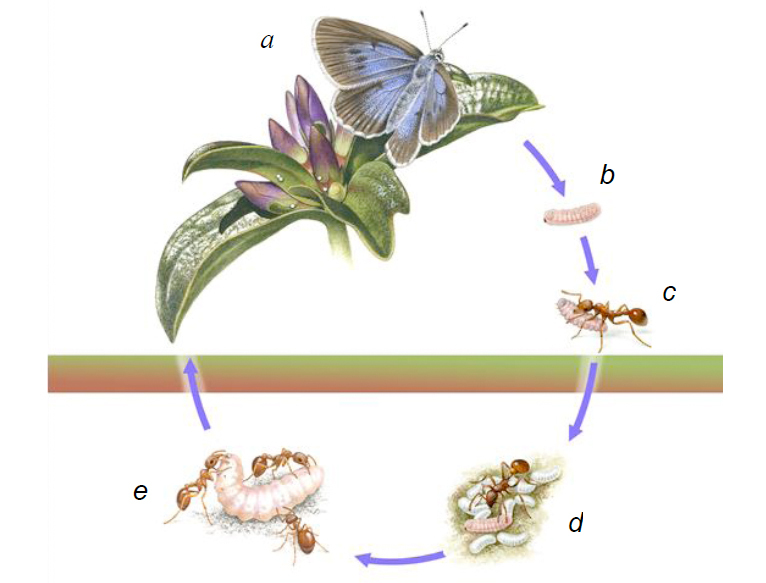 When the Mountain Alcon blue larva hatches, it eats the gentian until it reaches a certain size whereupon it falls to the ground and releases an allomone—a deceptive chemical which makes it seem identical to an ant larva. Foraging ants discover the caterpillar and tenderly carry it deep within the protection of the ant hive to the nursery room where the ant larvae are fed and cared for. Then the caterpillar reveals another dark talent: it produces a sound which perfectly mimics the ant queen. Subject to this all-powerful voice of authority, the ants care for the caterpillar as though it were the queen–even going so far as to attack the actual queen. Obeying the dictates of the awful song, the ants feed the still living ant larvae to the caterpillar which devours the helpless young ants like so many little wiggling burritos (well, if juvenile butterflies ate burritos). 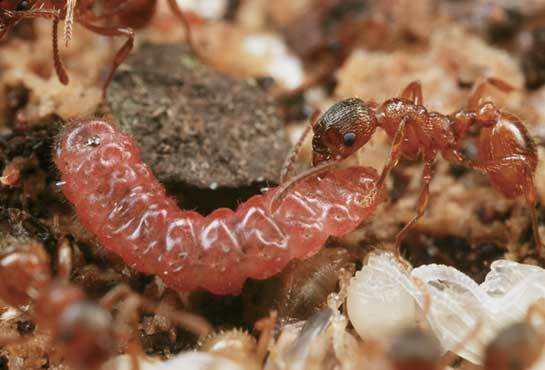 When the butterfly pupates into an adult, it loses its ability to mimic ant chemicals or produce the queen’s voice. 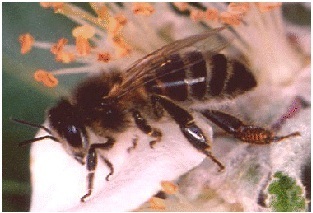 The ants recognize it as an invader and attack, but the butterfly’s scales are designed to resist their mandibles. It flees the crippled and abused ant colony and begins the cycle over again. Yet monsters still must fear other monsters and there is an even more invidious predator which seeks out the Alcon larvae deep within ant hives. This is the parasitic wasp, Ichneumon eumerus, which infiltrates ant colonies which are being preyed on by Phengaris rebeli larvae. 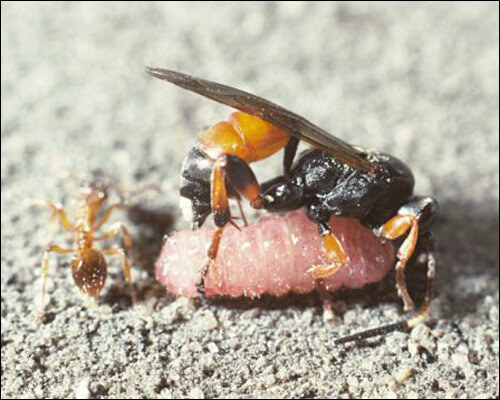 The wasp locates the caterpillar and then releases an allomone which causes the ants to go insane and attack one another. Then in the chaos that follows, the wasp injects its eggs into the living caterpillar. When the eggs hatch they eat the interloper from inside and then burst out of its carcass. Quail are mid-sized members of the Galliformes (the gamebirds) which live around the world, usually staying close to the ground where they hide among the undergrowth and peck out a living eating small invertebrates, seeds, and berries. Multiple species of the quail genus Coturnix live in China, where they have long been a favorite of hunters, poultry farmers, gamblers, and, of course, artists. Quail were associated with autumn and they form the centerpiece of several lovely scrolls and small compositions about the plants and flowers of fall. The birds also are utilized as a symbol of bravery (since a certain element of Chinese society fought male quail in battles reminiscent of cockfights and bet on the winner). 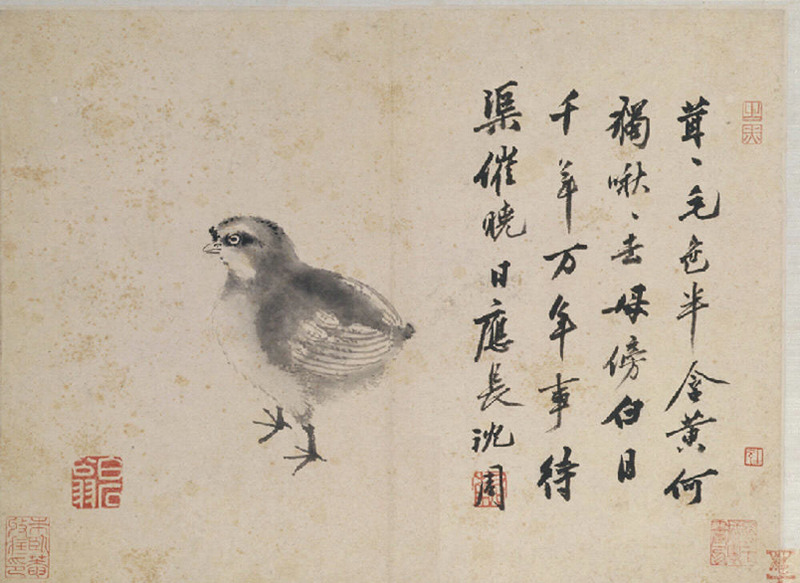 The painting at the top of this post also utilizes the quail as a symbol, albeit in a way which is extremely obscure to non-Chinese speakers. The Chinese phrase for 5 quail is “wu anchun”–and the first two syllables “wu an” are a homonym for “no peace” (in China, a land which frequently knows censorship, homonyms are an indirect way of making political of social comments). The painting above was thus a plangent comment on the fall of the Sung dynasty in the mid-13th century (which felt like a dark autumn to the Chinese literati). 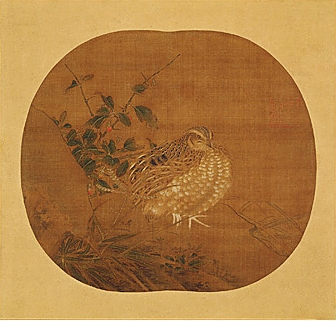 Fortunately the following quail paintings are not quite so somber in tone, but convey instead the beauties of autumn or the simple delight the artists took in the endearing rounded form of the wild quail. 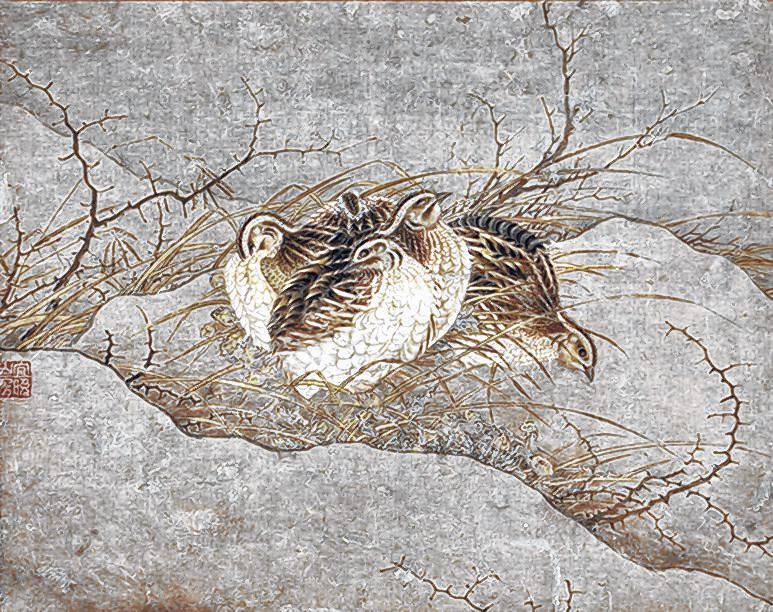 Here is an exquisite painting by the Song dynasty master Ts’ui Po which shows two magpies haranguing a passing hare. It is strange to think that this delicate and refined work was painted 5 years before the battle of Hastings. The word for magpie is homonymous with the word for happiness—so two magpies represent double happiness–shuāngxǐ—which is one of the most universal Chinese concepts. Lucky shuāngxǐ symbols are plastered all over all sorts of Chinese establishments and goods (I put one at the bottom of this post and I’m sure you’ll recognize it). 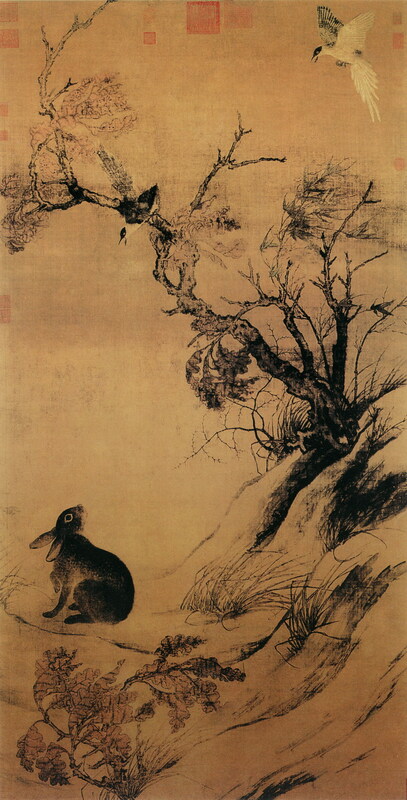 Ts’ui Po was famed for his ability to find the underlying rhythm in natural subjects and express it with simple fluid brushwork: the entire painting is structured as a gentle S-shaped curve, but within that compositional framework the hare and the magpies have their own calligraphic energy. Also note how wind is blowing back the branches, leaves, and weeds in the painting. Ts’ui Po captured the tao moving within a small ephemeral moment of natural beauty. 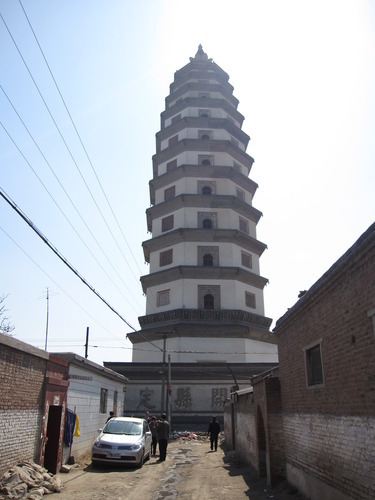 Built in the 11th century, the Liaodi pagoda in Dingzhou, Hebei is the tallest pagoda still remaining from China’s dynastic past (and the tallest building in China from before the twentieth century). 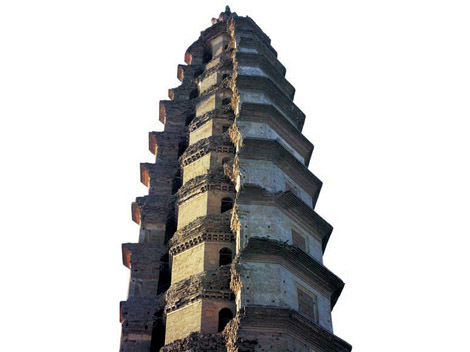 The stone and brick Pagoda was completed in 1055 AD during the reign of Emperor Renzong of Song. Although the pagoda was ostensibly designed to store Buddhist religious texts for the (now-destroyed) Kaiyuan Monastery, the name Liaodi means “watching for the enemy” or “forseeing the Liao enemy’s intentions”. The tall structure was built in a strategic location and Song military commanders used it to keep an eye on enemy movements of the nearby Liao Dynasty (a northern empire of Mongolic Khitans). 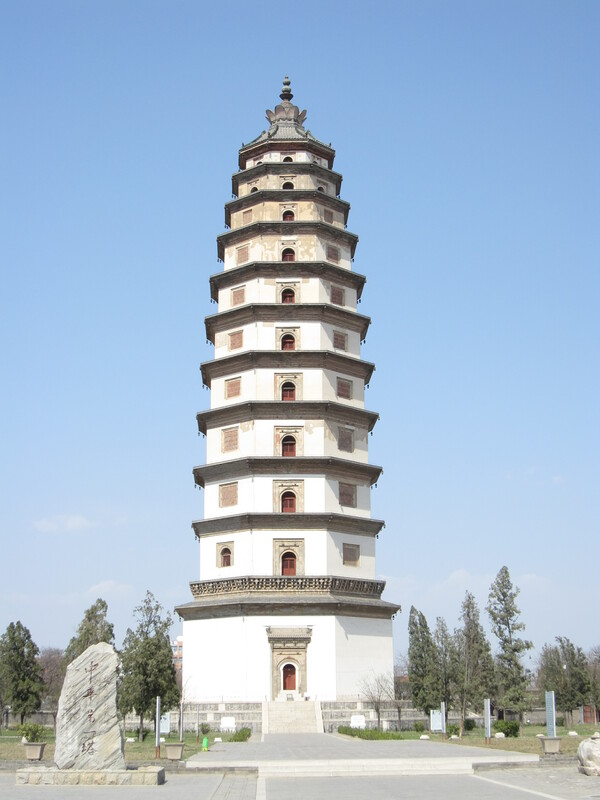 Including the elaborate bronze and iron spire at its apex, the Liaodi Pagoda is 84m high (276 feet). It is a pavilion-style pagoda made up of thirteen octagonal tiers. Uniquely, one section of the pagoda’s thick walls is split open to reveal a large pillar in the shape of another pagoda. I wish I could tell you more about this bizarre pagoda within a pagoda–but internet sources are strangely blasé about the fact that one of the most important historical buildings in China has a section cut away like it was a pilfered cake from the office fridge. Inside the pagoda are numerous painted murals and carved calligraphic plaques crafted during the Song dynasty (arguably the artistic zenith of classical China). Liaodi Pagoda's "pagoda within a pagoda"
My favorite of these myths concerns the hero Lemminkäinen, a warrior and shaman who fell in love with one of Louhi’s daughters. 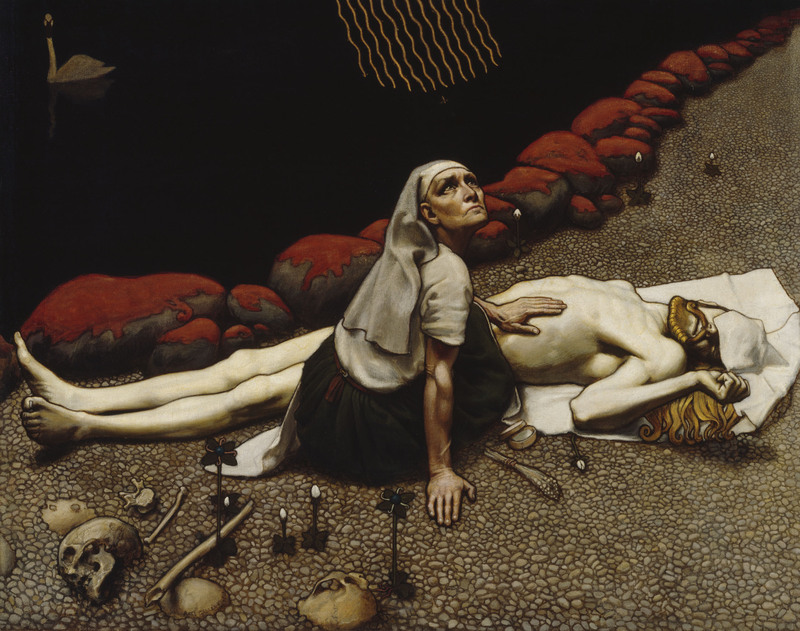 Louhi promised the maiden’s hand to Lemminkäinen only if the hero could bring back the lifeless body of the swan of Tuonela. 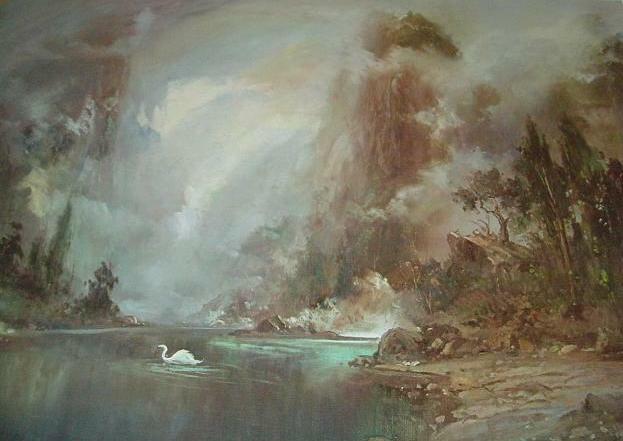 Tuonela was the Finnish underworld, a magic haunted island ruled over by the dark god Tuoni. 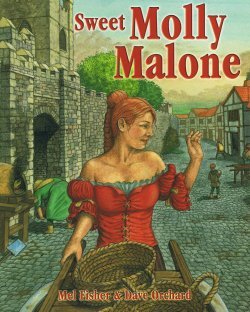 Getting there was no easy task and returning was much harder (several other stories about suitors seeking the daughters of Louhi involve Tuonela and its dreadful snares). The swan was a transcendent being which swam around the island of the dead singing. 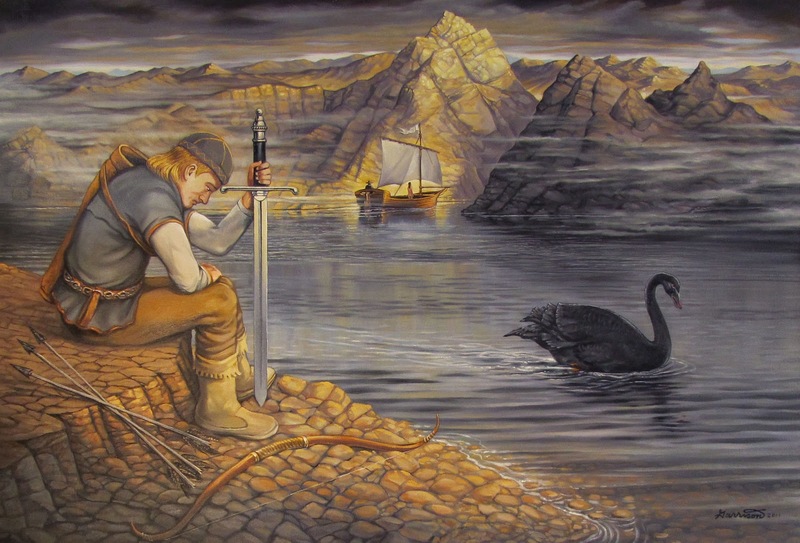 After great travails Lemminkäinen made it to the underworld and he found the magic swan, but as he drew his arms to kill the bird, Louhi’s cruel guile became apparent. The swan began to sing a haunting song of divine beauty. The golden notes described life’s splendor and its heartache—the wordless music summarizing everything that people long for and care about in their journey from the cradle to the grave. The impossible sadness and magnificence of the song moved Lemminkäinen’s heart and he realized he could not kill the great bird. As Lemminkäinen faltered, he was spotted by the gods of the underworld. Infuriated that anyone should threaten the great swan, Tuoni’s blind son sent a poisonous watersnake to bite the suitor. Lemminkäinen tried to sing away the venom with a shaman spell but he knew no words of magic against watersnakes. The whirlpool of the river of death caught him and his body was ripped into pieces which sank among the underwater boulders. Lemminkäinen did not return home and his aged mother began to worry about him. She went through the world seeking him in the dark forests of the south and in the lichen-shrouded wastes of the north. She spoke to bird and bear and deer and fish looking for her son. She questioned the yellow moon and the silver stars but they were indifferent. Finally she prostrated herself before the red sun as it set in the west and the sun god gave her the terrible answer that Lemminkäinen was lifeless, cut to bits in the black river of Tuonela. 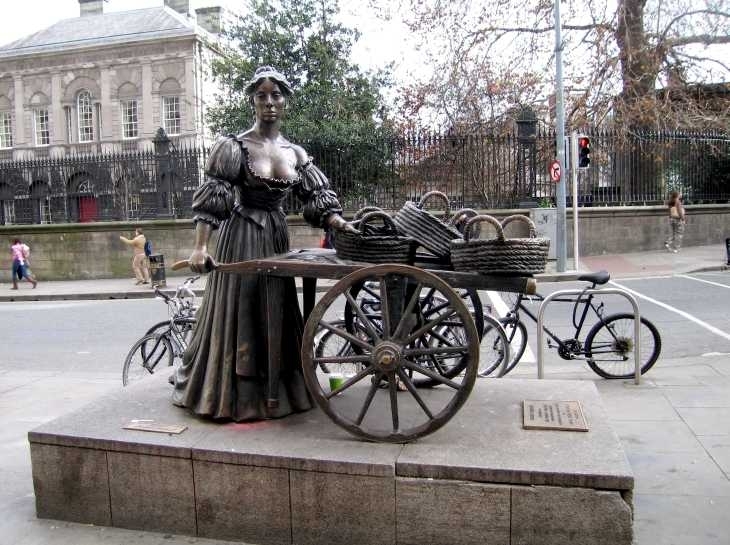 Broken with grief she went to the smith god Ilmarinen and begged him to make a huge dragging rake for her with a copper handle and steel tines. 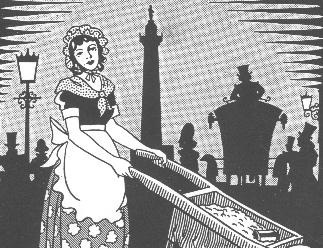 Then she went to the river and laboriously found the many waterlogged fragments of Lemminkäinen’s corpse. She pieced the shattered bones and torn sinews together and sang the most powerful songs of healing magic to reassemble the body, but still her son remained lifeless. All of her prayers and supplications and lamentations went unheeded by all gods and creatures save for one. A little bee landed in front of her and promised to help. Furiously buzzing her wings, the tiny insect flew away up into the sky and then farther up to the vault of heaven. She crossed Orion’s shoulder and flew across the great bear’s tail. Finally she reached the heavenly abode of of Jumala, the Creator God, where he had crafted the universe. The bee flew through the immense palace until she found a golden vessel filled with healing honey. Then the little bee took a drop of the honey and flew down through the stars back to Lemminkäinen’s mother. Together they placed the honey on his tongue and color came back to his lifeless form. He struggled and shuddered and then gasped for air, waking from the world of death with its whirlpools and dark waters. But the swan’s haunting song was with him all of his days as was knowledge of what waits in the death’s dream isle at the end of the world. And that’s how Lemminkäinen learned that Louhi’s daughter was an unsuitable bride. 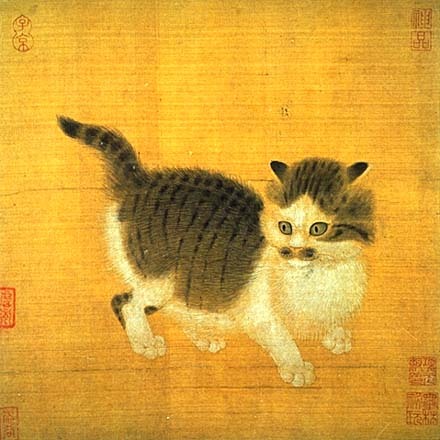 Once again I am shamelessly trying to seize the attention of the internet’s kitty-loving throngs, this time via the unconventional path of Song dynasty artwork. The Song dynasty flowered between 960 AD and 1179AD. It was a great age for China and the great age for Chinese art. 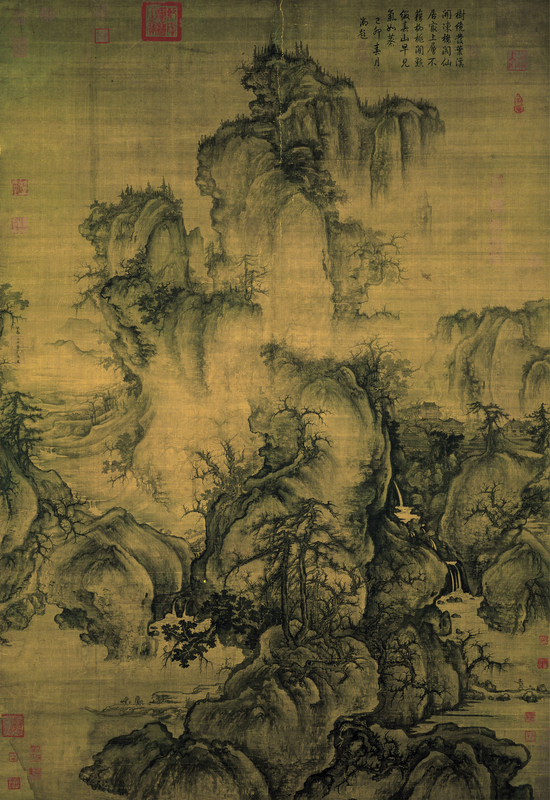 Traditional Chinese painting reached its zenith during this time: all subsequent Chinese painters have looked back to Song paintings either for inspiration or in rebellion. Although Song artists found antecedents in the styles of Five Dynasties Period and the Tang dynasty, they vastly outdid their predecessors. Their age has become synonymous with exquisite deft naturalism. Here an unknown painter from the twelfth century has perfectly captured the likeness of a little tabby kitten. The painting accurately portrays the delicacy, naïve curiosity, and cuteness of a kitten–and yet there is also an ineffable hint of wildness in the animal’s mien which suggests what a fearsome predator a cat can actually be.